We know you may want to burrow under your duvet and hibernate for the period between January and March, but with so much wintery beauty all around you, there’s no excuse not to go out and enjoy the city’s stunning landscape, even if we’re not lucky enough to have snow this year. From desolate abandoned railway routes to a surprising abundance of wildlife, London offers more than just a couple of fields and trees this winter. Wrap up warm, grab a coffee and join us on a walk across frosty London. Stepping into Richmond Park, you will feel a million miles away from London. 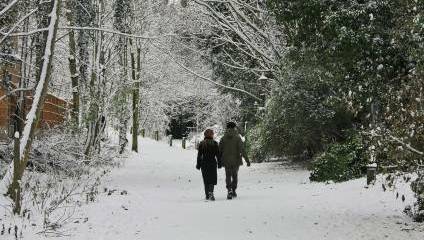 A place of outstanding natural beauty and one of London’s largest enclosed green spaces, it is beautiful in every season, but the winter chills give it a new power. Wander through white forestland with its ancient, icicle covered trees, see the expansive lakes when they are completely frosted over, and catch glimpses of the wildlife including 350 fallow deer and bats. Remember to stop off and see the extensive range of rare and unusual plants at the Isabella plantation before enjoying a warming cup of tea in Pembroke Lodge, a preserved Victorian mansion. Richmond TW10 5HZ, find out more here. This 4 and a half mile walk between Finsbury Park and Alexandra Palace is something of a hidden gem. Combining the urban with the natural landscape, it runs the course of the now disused and barely traceable Northern Heights railway line. It’s impressive natural features are made all the more extraordinary by the fact that trees could not grow on the track when it was a working railway station, but many years later it has almost every tree type possible, from oak to field maple. You’ll stumble across an abandoned railway underpass that is now used as a bat sanctuary, as well as other wildlife such as hedgehogs, butterflies and foxes. According to urban legend the walk is haunted too, so late evening wanders are only for the brave! Find out more information about the walk here. Nobody wants to get lost on a chilly winter walk, so this straightforward route between South West London’s Twickenham and Feltham is the ideal choice for a exploration of nature and all its flora and fauna. The River Crane is largely unknown compared to other London rivers, but with its varied selection of bird species including kingfishers, herons and woodpeckers, as well as the dense woodland that surrounds it, it’s a lovely family day out. Make sure to look out for the shot tower, an old gunpowder mill and the Crane Park Island nature reserve. The River Crane walk begins in Twickenham and finishes in Feltham. Find out more here. Covering 37 acres and comprised of 53,000 graves, a walk through Highgate Cemetery might seem like a morbid choice, but with its overgrown bushes, large overhanging trees and ivy intertwining around the graves, it makes for a somewhat ghostly experience that is particularly pertinent in winter. The cemetery combines gothic funery architecture with a natural haven of extensive shrubbery, trees and wild flowers. Keep to the main pathway or delve further into the overgrown areas, making out inscriptions and spotting famous individuals such as Karl Marx who are buried there. Swain's Ln, London N6 6PJ, find out more here. There’s something particularly atmospheric about walking around the grounds of a stately home in the biting frost. Transport yourself straight into a period drama at the Osterley Park and House, an 18th century mansion designed by famed London architect Robert Adams in the London Borough of Hounslow. With its acres of woodland and nature trails, it is perfect for a leisurely Sunday afternoon stroll. Go on a nature trail with the kids or explore the Winter Garden, beautiful and blooming with frost outlined berries, vegetables and roses even in the freezing cold. Jersey Rd, Isleworth TW7 4RB, find out more here.